This morning I noticed a very interesting retweet by fellow vExpert Wil van Antwerpen from another vExpert: Richard Cardona (You may know him as rcardona2k on the VMTN Community Forums) about a neat little trick with the use of remote ESXi Shell (previous known as remote TSM). 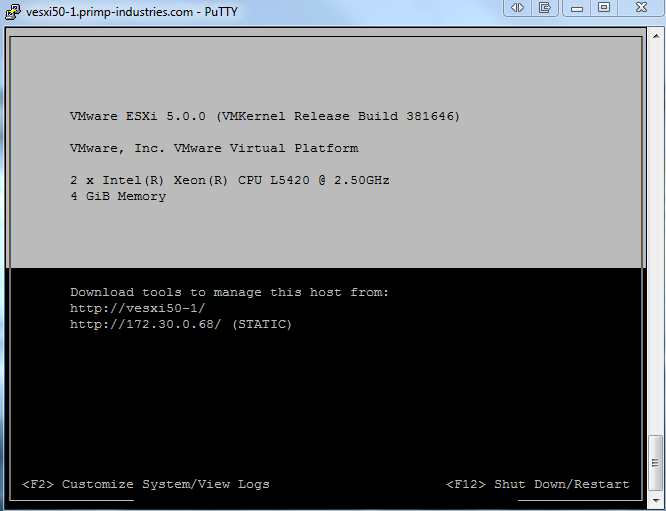 For those of you who login remotely via SSH to the ESXi Shell (previously known as unsupported mode and Tech Support Mode) know that you can run the DCUI utility remotely by just typing "dcui". The remote DCUI works just like it does using the direct console, with the exception of displaying the famous yellow and black screen that we are familiar with. Richard came upon a neat little trick by setting the terminal type to "linux" from the default "xterm" that the yellow and black can be enabled when using the remote DCUI. Note: As you can see this is not a new trick in vSphere 5, but has been there since 4.x days but one big change with vSphere 5 is the full resolution of DCUI which many have complained about in the past. I am seeing the same problem. Alt+F2 is also not working. It shows as yellow. But, none of the keys are working. Login again and it should be working as the console does.